In The Girl Who Circumnavigated Fairyland in a Ship of Her Own Making (my review), 12-year-old September is at one point under a spell or curse that is turning her into a tree. Her skin turns thick and bark-like, her fingers turn into bundles of twigs that snap off, and her hair turns into dry leaves that blow away, leaving her bald. At one point, a hole opens in her cheek and continues to get bigger. 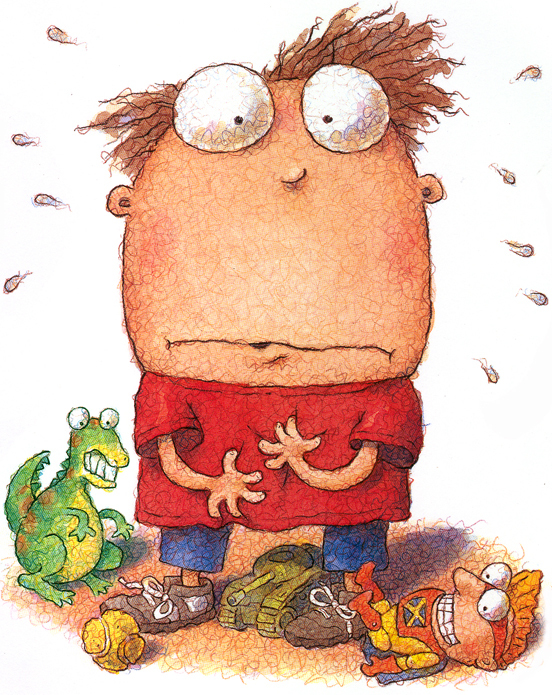 This scene continues to haunt me, and it reminds me of several picture books, all of which happen to be fine read-alouds. Tedd Arnold's Parts is narrated by a young boy who is panicking because parts of him keep falling off or coming loose - his hair, his belly button lint, his boogers, his teeth. The joke is of course that this is normal - but the poor kid is envisioning total physical breakdown when he wails, "And now I'm thinking to myself/What's next in line to go?/Might be my ears; might be my eyeballs./How's a kid to know?" In David Small's Imogene's Antlers, a girl happily spends the day with a huge pair of antlers rearing from her head (though her parents aren't too pleased), and then wakes up the next morning with the antlers gone but an entire peacock's plumage erupting gloriously from her rear end. One can only assume that these strange transformations will continue indefinitely, making Imogene's life rather unpredictable. How can one plan one's wardrobe when one has wings one day and flippers the next? In David Shannon's A Bad Case of Stripes, poor Camilla's skin keeps changing from one wild pattern to another, and each "cure" makes it worse - "She sprouted roots and berries and crystals and feathers and a long furry tail." 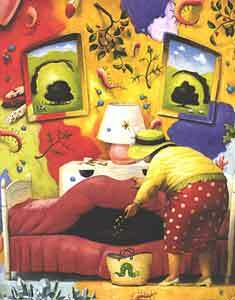 Finally, she melts into her room - "Her bed became her mouth, her nose was a dresser, and two paintings were her eyes." Could this be any more nightmarish?! The illustrations are downright terrifying. Now - these books are lighthearted and funny, and even have small lessons embedded in them, but I find the situations extremely disturbing. Most people have had dreams of their teeth falling out 2 and 3 at a time, and these are always nightmares. They seem, in my case, to be connected with a feeling of not being in control of some aspect of my life, whether it's my family life or my job or my own ability to stay sane and organized. But as I read about September's discomfort and even terror as her body became an alien, disintegrating thing, it occurred to me that I understood exactly how she felt. It's not just lack of control, but the knowledge that this particular kind of helpless change is leading directly toward death. I have felt much the same emotions myself over the past 10 years, as I noticed the first lines at the corners of my eyes and observed my hair becoming ever more gray. It's with true dismay that I behold the crepey skin at the insides of my elbows and all over my neck. ("I feel bad about my neck" doesn't even BEGIN to cover it). It's just going to get worse! Until I'm dead! No wonder all those tales of uncontrollable transformation creep me out. Of course, kids are transforming at a much more rapid rate, and they manage to handle it (until puberty, when heretofore imperturbable kids stare in the mirror in horrified disbelief at their pustule-covered faces, awkward bumps and protuberances, and hair sprouting from strange places). It's just another phase of life, this new downward slide toward the grave, with its inexorable loss of skin tone and increase of wrinkles. I'm sure I'll adjust more or less gracefully, as billions have before me. What choice do I have? Oh, but that ever-widening hole in September's brittle bark cheek... I'm going to have nightmares for MONTHS!! Great post. I also read In The Girl Who Circumnavigated Fairyland in a Ship of Her Own Making and found that section haunting. 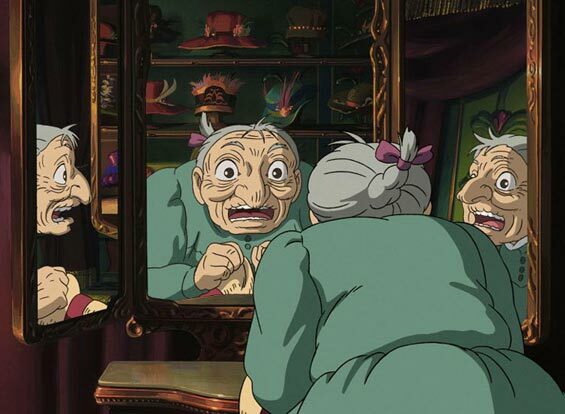 And since I read Howl's Moving Castle and saw the Miyazaki film, Sophie's transformation was also one that stuck with me (but was not as creepy as September's transformation). Though Sophie is horrified at her transformation into an old lady at first, she accepts it after a while and just gets on with things, and that's how I've been trying to do it, too. But I think we all have the right to stop and wail for a few moments, just very occasionally, before shrugging it off and moving on! A child's world is not the easiest one to correlate with. It's a completely separate one with that of an adult, and this world is full of imagination and fantasies. RightToys.In has shown it's effort in touching this world, and www.righttoys.in/products.asp?brand=145 is the destination to visit that world.